Gymnastics Australia’s (GA's) Child Safe Policy and Member Protection Policy are part of the organisation’s proactive and preventative approach to uphold our commitment to the safety, wellbeing, participation and empowerment of all children who access our activities, programs, services or facilities. The Member Protection Policy and the new Child Safe Policy should be read in conjunction with each other. 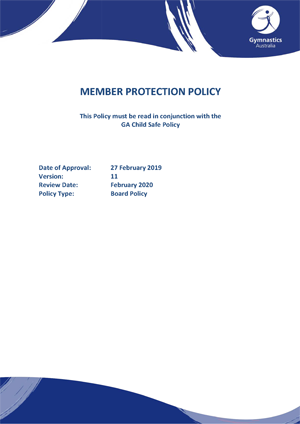 The Child Safe Policy outlines the Codes of Behaviour expected when dealing with children, whilst the Member Protection Policy outlines the general Codes of Ethics and Behaviour for specific cohorts within the sport. It also outlines the discipline by-law and appeals process. Both policies apply to anyone involved in the sport of gymnastics in Australia including (but not limited to) employees, members, parents/guardians, spectators, volunteers, judges and other officials. 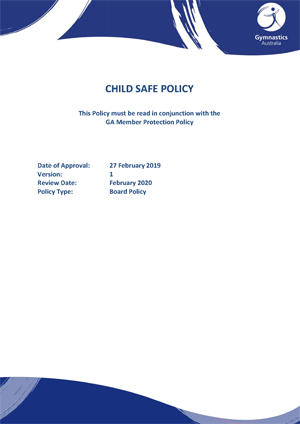 For a comprehensive list of who is bound by these policies please refer to Section 1.3 of the Member Protection Policy and Section 3 of the Child Safe Policy. GA encourages everyone to read and understand both policies in detail. For all other Gymnastics Australia policies please click here.